Flash animations make the internet come alive, immersing viewers in dynamic motion and sound. 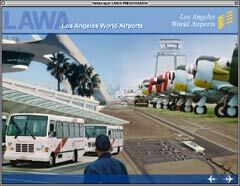 Los Angeles World Airports (LAWA), the organization overseeing four of Southern California's airports, needed a vehicle to present information about the progress and development of the Los Angeles Region's airports. We provided them with a flash presentation that was distributed as mini-CD-roms and over the Internet.